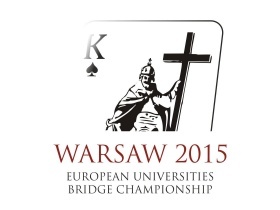 From 31st August till 6th September 2015, EUSA (European Universities Sports Association) and Local Organizing Committee will organise in cooperation with EBL (European Bridge League) the 4th European Universities Bridge Championship in Warsaw, Poland. All official entries are only possible via the National University Sports Federation http://www.eusa.eu/eusa/members (not via the National Bridge Federation). The deadline for registration is 15th July 2015. After 11 matches, the Institute of Chemical Technology from Prague won the challenge. Runner up the University of Warsaw 1 and third place for the Wroclaw University of Technology.